Hi again guys. I recently purchased a movie; Battle Los Angeles. Some of you may have heard of this film, if not; i GREATLY recommend you watch it. 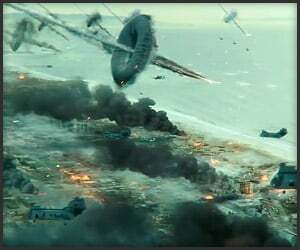 The movie is about aliens invading Earth in what looks like meteors plummeting the planet; strangley enough the "meteors" are slowing down before impact, this even seems to be happening at every major civilisation located on the coastline. From what we can gather it's for the vast amounts of water found here; the aliens seem to use it as some sort of fuel. The storyline follows the path of Echo Company's 2nd Battalion 5th Marines. Who soon find out the real intentions of their extra terrestrial invaders. I'll say no more. Overall i really enjoyed the film; i found it extremely easy to get into & was on the edge of my seat pretty much throughout the whole film. 10/10 from me. Sup guys, pardon me for living under a rock, but a friend was telling me about the U.S Office, with me not spending much time indoors & not watching alot of T.V, he recommended that i watched this. and OH MY GOD is it funny. If you are a fan of this series, i greatly apologise for not giving it the chance it deserved. I've already purchased "The Ultimate Package" box set & i'm hoping for it to arrive soon. If it's not the funny jokes that come from nowhere (That's what she said hehe ;)) Its the wacky characters. My favourite without a doubt being Dwight; he's just crazy. That's all i can say, he's just so strange to a point it's not that strange anymore, but utterly hilarious. But seriously, if you've never tried it, i GREATLY recommend it.